The Reverie FQ350 is an Alcantara trimmed steering wheel which is available in a range of different drilling patterns including MOMO/Sparco/OMP, Nardi, 3-Stud or Raid drilling patterns. Alternatively, we also make undrilled FQ350 steering wheels or if you require a special drilling pattern, we can accommodate that too. The FQ350 is also available with two button holes (one either side) or three button holes (one on each spoke) to allow buttons/switches to be placed for fingertip/thumb controls. The FQ350 steering wheel weighs from only 305g - a significant weight saving over conventional steering wheels and a necessity for racing applications. 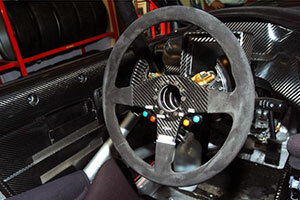 View our full range of FQ350 steering wheels. Below, first select which drilling pattern you require (if you require a special drilling pattern, please contact us first), then select whether you require 2, 3 or no button holes.